Midtown Commons Project in Neptune, NJ. The New Jersey shore town of Neptune is both a destination and a busy thoroughfare for shore-bound travelers. Traversed by Routes 18, 35 and 33, and easily accessible from the Garden State Parkway, the New Jersey shore town of Neptune is both a destination (the township’s seaside hamlet of Ocean Grove, for example) and a busy thoroughfare for shore-bound travelers. Despite its prime location, areas within the township began to show signs of decline, with commercial establishments becoming vacant and in disrepair. In 2004, the Neptune Township Committee drafted a strategic revitalization plan that encompasses all of the township’s “Gateway” areas, with a particular focus on the West Lake Avenue section—which was, at one time, one of the premier commercial corridors of the township. To address the needs in the West Lake Avenue or “Midtown” district, the township partnered with three entities: CityWorks, a nonprofit corporation whose mission is to facilitate real estate projects in economically distressed neighborhoods throughout New Jersey; the Neptune Economic Development Corporation; and the Midtown Urban Renaissance Corporation, a nonprofit made up of residents, business owners and religious and civic leaders. Together, they spearheaded an effort to redevelop the commercial corridor. Input from the community was fundamental to the planning, with more than a dozen meetings held with residents from the planning stages into the construction phase. The initial phase of the Midtown Commons project is a 51,000-square-foot, $18.5 million office/health center complex on West Lake Avenue. 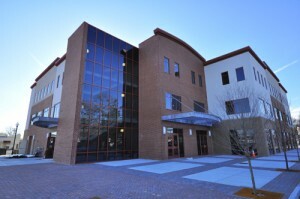 Its principal tenant is the Family Health Center, relocated from the Jersey Shore Medical Center campus. In the new facility, the health center occupies 30,000 square feet, a 35 percent increase over its former site. More important, it provides greater access to medical treatment in an underserved neighborhood—and it has brought 50 permanent professional and administrative jobs to the West Lake Avenue corridor. The New Jersey Division of Taxation will occupy an additional 15,000 square feet of office space and will bring 75 permanent jobs. CityWorks will also be developing a property management company with the Midtown Urban Renaissance Corporation. This new entity will assume property management responsibilities for the commercial building, as well as the balance of the project, thus creating a new entrepreneurial opportunity for the Midtown area. CityWorks has submitted an application to the New Jersey Housing Mortgage Finance Agency for financing that will provide a second phase of the project with 22 units of mixed-use affordable rental units. An additional 97 units in the approved plan will be a mixed-use configuration with 27 units pledged for affordable housing. Also included in the balance of the project are an additional 60,000 square feet of retail/commercial space that will provide the neighborhood with a daycare facility and a .75-acre urban park funded in part by a Centers of Place Grant from the New Jersey Department of Transportation. Construction of the park will begin in the fall of 2010. As the project is completed, the plan is to create a “Life Style Services” neighborhood that will allow for goods and services to be provided in a walkable range for residents of Neptune’s Midtown neighborhood. Two major obstacles had to be overcome to move the project past the planning stage. The first was financing, which was provided by the New Jersey Economic Development Authority through the New Markets Tax Credit program, and the Local Development Finance Fund in concert with TD Bank. The second was environmental, requiring the award of a Brownfield Development Area designation by the NJ DEP Office of Brownfield Reuse.